An expert's guide to backyard squirrels (whether you love them or hate them!) This 32 page booklet includes a range maps and information on all squirrels as well suggestions on foiling squirrels and protecting your feeders. Motor driven, battery powered, weight activated perch ring. The "Number 1" selling Squirrel Proof Feeder available. Guaranteed Squirrel Proof - Openings in the wire shroud align with seed ports and provide access to the seed. When a squirrel climbs onto the feeder, its weight forces the shroud down protecting the seed. All squirrels are foiled but not harmed in any way. Feed all of your favorite birds without feeding squirrels. 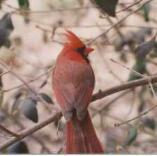 The feeder can also be adjusted to feed Cardinals without feeding heavier unwanted Grackles and Starlings. Large all metal feeder with extra perch area. 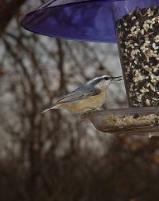 Birds can feed from both sides and perches have adjustments to eleminate squirrels or large birds. Comes complete with pole. Holds 12 lbs. of seed. The Sky Cafe Color Combo comes to you as a complete package with a 5 piece 72 inch pole and squirrel baffle. 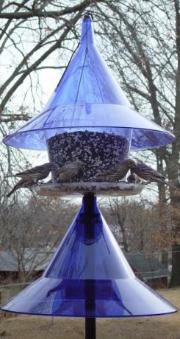 The 17 " squirrel-proof dome protects the bird seed in all types of weather.